Introgression is the diffusion of alleles from one population or species into another as a result of interbreeding or hybridization between them. And that hybridization is (roughly) the breeding of two distinct species. 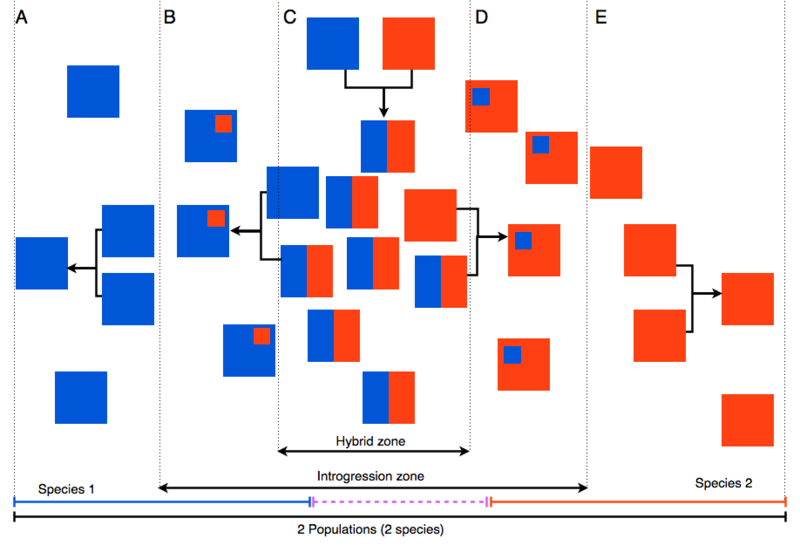 I thought that when we were talking about introgression zone and hybrid zone, it was the same thing. See the image below. Across an area, you would have 2 populations of 2 species (A-E). They could interbreed in the middle, this would be called the hybrid zone (in C). But the change of allele (or the transfer of allele) between two populations is not only done by hybridization (B vs C). It can be done by a new hybrid breeding with a non hybrid (backcross, in B). Then, B to D would be the introgression zone. I don't really know what would happen in that case when 2 hybrids breed together for the colours! So my question is: What is the difference between introgression zone and hybrid zone (is my interpretation correct?)? Interesting that you're received no responses to this. It's an interesting (and I think important) question. Not the answer you're looking for? Browse other questions tagged molecular-genetics hybridization or ask your own question. How and why are cells irradiated in human-rodent hybrid cell biology?